Fans of Chopped were greeted with a pleasant surprise when a recent episode featured teenage chefs. However, these were not your ordinary teenagers, as each contestant showed great composure, talent, and charisma like the adult contestants on the show. 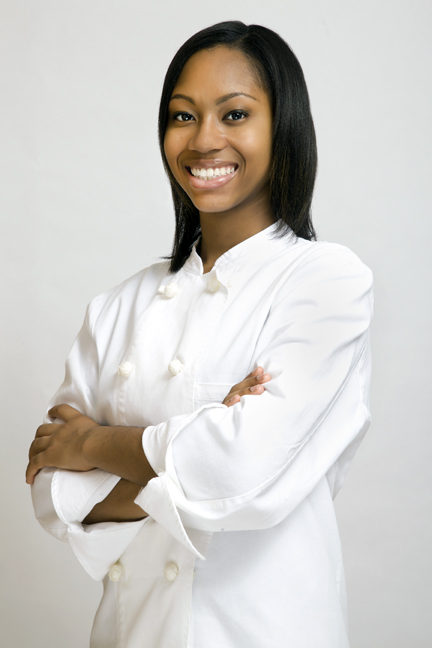 One chef that stood out the most was Shania Thomas, who became the first-ever teenage champion on Chopped. We caught up with Shania to find out more about this up-and-coming culinary star in the making. FP: How did you get your start with cooking? What do you enjoy most about cooking? ST: I started cooking when I was very young, around six years old. My family loves to cook and eat. So growing up I spent most of my time in the kitchen watching them cook. I knew I wanted to be a chef at the age of four. So I worked at it. Being in the kitchen is the greatest thing in the world to me. The thing I enjoy most about being in the kitchen is taking the time to create something that I know will blow people away with flavors and textures, as well as be beautiful to the eye. Cooking is much more than just having a skill and knowing how to use it; it’s also about knowing how to incorporate your heart and soul into it to make it a masterpiece. FP: Sounds like you were born to cook. From watching Chopped, we can see why! Speaking of Chopped, tell us about your experience on the show from casting to filming. What was it like to compete with the other chefs? What did you learn from the judges? ST: Chopped was the worst and yet the best thing I have ever done in my life. I say the worst because the competition was so fierce and so nerve-racking that there was a moment where I thought I couldn’t make it through. It is truly not for the faint of heart. But as nerve-racking and stressful as it was, it was also the best thing I could have ever done. I went up against three extremely talented young chefs, put my skills to the ultimate test, and did something that even the most seasoned chefs sometimes stumble over. And to come out as a champion is just a testament to how hard work, determination, and perseverance truly does pay off in the end. The judges were amazing, and I took all of their constructive criticism in stride. They gave me golden nuggets of advice that I will carry with me forever: to never limit myself and no matter what, always strive for the next best thing and keep pushing myself. FP: Sounds like it was a great experience for BOTH you and the judges, as they learned more about your culinary talents. Name some chefs who have inspired you. ST: I always cite Julia Child as my culinary inspiration because I feel we have so many things in common. Like Julia, I had a number of people in my life tell me that I couldn’t become a chef and that I would never make it. Like Julia, I proved them all wrong. Her drive and will to do what made her genuinely happy is what made her a culinary legend, and that is something I can only hope to come close to emulating. Aside from Julia Child, I can say that all of the baking and culinary instructors I had while attending Food and Finance High School have inspired me. They are truly some of the most talented chefs I have ever known and they are the most amazing teachers a budding chef can ask for. They took the time to take the raw talent I had as a freshman and refine it, and put me in situations where I could flourish and grow. For that I will always be grateful to them and to the entire faculty at the school. Many of the amazing opportunities I’ve had came from my high school, including getting on Chopped. I am also extremely fortunate to have been a part of Careers through Culinary Arts Program (C-CAP). The program taught me many of the necessary skills needed to succeed in the food industry and has provided me with a number of opportunities including a scholarship to The Culinary Institute of America (CIA). Another chef who has inspired me greatly is Chef Kwame Onwuachi, a young entrepreneur and my mentor. He is an absolutely fabulous chef and working with him has really taught me a lot. FP: When you are home, what are some of your favorite meals to cook for yourself or for guests? ST: I love pasta. Spicy shrimp scampi with lemon and garlic is something I make as often as I can. Pair that up with cheesy bread, Caesar salad, and a ginger ale, and I am one happy camper. FP: Shrimp scampi sounds good to us! You can cook for us anytime! ST: Cheesecake!! I cannot live without cheesecake. If I can’t get around to making it myself because of how busy I can be, trust me I will travel all the way downtown from the Bronx to my favorite Italian bakery to get a marble cheesecake. It gets pretty serious at times. FP: Cheesecake is definitely one of our foodie pleasures for sure! Name three individuals you would invite over for dinner and what you would prepare for them. ST: It would be a dream come true to cook for President Obama and the First Lady. In addition, I would like to cook for celebrity chef Alton Brown. I love our President and First Lady, and chef Alton Brown is one of my favorite chefs. I’ve been a fan of his since Good Eats. It was and still is one of my favorite cooking shows. For them I would make well-seasoned pan-seared bone-in pork chops, with balsamic spinach and tomatoes, served atop a cauliflower puree. Just good comfort food with a gourmet twist. FP: What advice would you give to other teenage chefs? ST: Follow your dreams. If it’s in your heart to be a baker or a chef, go for it. Don’t hold back. Set your sights on a goal and then run with it. Never give up or let anyone try to deter you from accomplishing your goals. You can do anything you set your mind to. This is a tough industry to get into and stay in, but if you work hard and stay determined you will go far. If you are hungry for success and take the right steps, you will eventually gain it. FP: Wise words indeed. Thank you again for your time and good luck with everything. We have no doubt that your future is bright! Shania Thomas is a graduate of Food and Finance High School in Manhattan and is part of the class of 2012 at the Borough of Manhattan Community College. With a generous scholarship provided by C-CAP, she will be attending The Culinary Institute of America (CIA) where she will be majoring in Baking and Pastry. Careers through Culinary Arts Program (C-CAP), which was founded by culinary educator and cookbook author Richard Grausman, is a national nonprofit leader in providing culinary career opportunities for at-risk high school students and operates the largest independent culinary scholarship program in the United States. For more information about C-CAP visit www.ccapinc.org. Thank you so much for reading our blog post about Shania. We have no doubt she has a bright future! I’m so proud of my cousin Shania. To watch her grow into this wonderful young woman is amazing. I can’t wait to see where her career takes her. Thanks for reading our interview with Shania. Please share with rest of your family and hers. Shania definitely has a bright future ahead! I would love to interview Miss Shania for my brand new show Teens with A Dream! Thanks for reading our interview with Shania. We will reach out to her and get back to you. Just watched the show and she’s a gem! Can’t wait to eat at her establishment one day. Rock on, Shania! Great Job. In a few short years you’ll be Chef Shania with your own TV show.